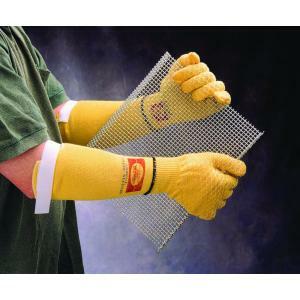 Double-layered for greater forearm protection, Ansell's GoldKnit Sleeve 70-138 features 100% Kevlar fiber cut protection. There's extra comfort with a thumb-slot and Velcro strap. 45 cm in length, the GoldKnit safety sleeves also protect your forearms from minor burns and heat.This comfortable and flexible work protection gear is well-suited for handling durable goods, metal stamping and safety in the automotive and glass industries.